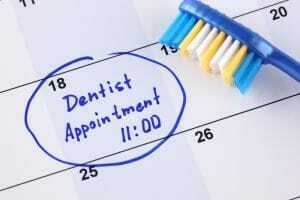 Are 6 month dental appointments necessary? A blog looking at whether it is necessary to attend your dentist every 6 months. I recently read an article in the Telegraph that a dentist has stated that it may not be necessary to attend the dentist every 6 months. Many people assume that they should attend the dentist every 6 months and this is often ‘drummed’ into people when they attend the dentist. A dental check-up is primarily focused on the mouth and teeth, and your dentist will be able to see if you have any dental problems. However, there are a number of other health issues which can be identified in a dental examination. Provide advice about oral hygiene, and smoking and alcohol use. “It’s down to patients to say “why do I need to come back in six months?”. It all depends on a person’s dentition as to whether they will need to attend the dentist regularly or not. If people are in doubt about how often they should attend, then this should be discussed with their dentist. The NHS provides guidance and advises that some people with good oral health will probably need to attend only once every 12 to 24 months, but those with more problems will need check-ups more often. However, this advice is only in relation to routine check-ups and if you are undergoing dental treatment, then you are likely to need to attend more often.